The Harry Potter textbook covers are live on my website! Drawings for the 31 covers were created over the month of July 2017, and I have been colouring them since then. Here’s the link to the brief that I set myself at the beginning of the month. The interesting thing about doing a daily challenge like this is that you have to go with your first idea, as you don’t have time for a lot of brainstorming. My Pinterest board of vintage book covers was my reference point throughout the project. I would look through the board until I found a composition or typography style that I could use as a springboard for my own design. The great thing about this challenge was that there was very little information about the books themselves. This gave me the freedom to interpret the title as I liked, an opportunity not often given to cover designers. 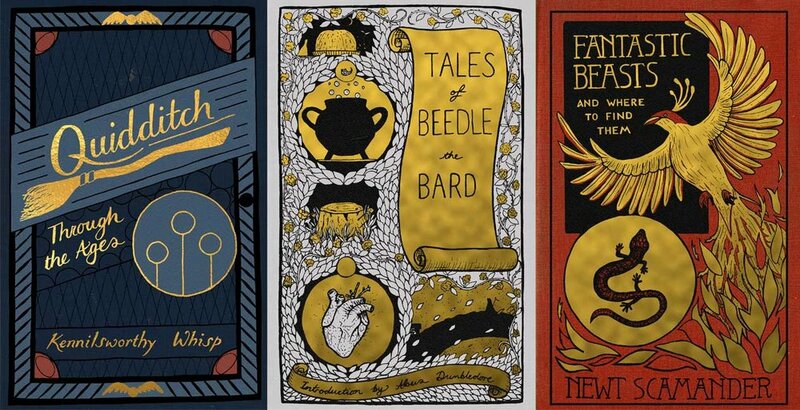 That said, I did particularly enjoy designing the covers for Tales of Beedle the Bard, Quidditch Through the Ages and Fantastic Beasts and Where to Find them, all of which have published texts associated with them. I wanted to make them very different from the published versions, as well as those created for the films, while also making them look credible within the world of the books. This is one of my first forays into non-fiction cover design. Ironically, the non-fiction is fictional, so had to fit within the visual language of the Harry Potter universe. The way that J.K. Rowling describes objects within the Wizarding World suggests that wizards have appropriated and modified a hodge-podge of muggle artifacts, as well as creating their own from scratch. 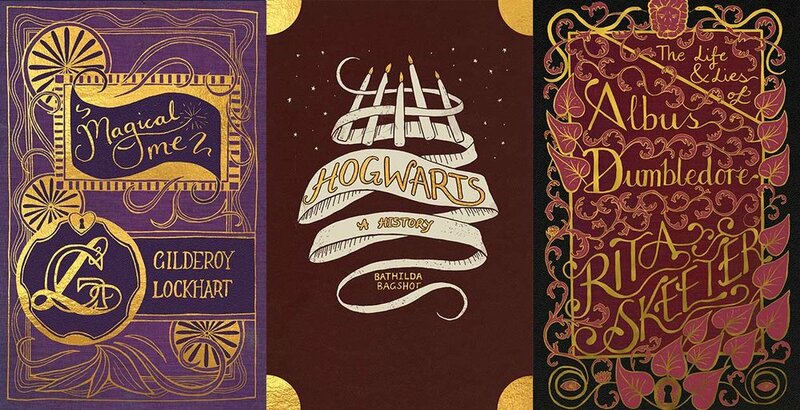 Having the books take influence from Victorian book design made a lot of sense, as well as allowing me to do a deep-dive into the history of the books of this time. As well as fictional works, I looked at textbooks and non-fiction from the late 19th Century through to the 1940s. Non-fiction covers can be, and often have to be more literal than fictional works. I found that this left me with more time to focus on the typography and illustration. There were a few times where additional knowledge from the books was very helpful, rather than just going on the title and author alone. The first cover, Hogwarts: A History features the floating candles of the great hall, first described in Harry Potter and the Philosopher’s Stone. The Gilderoy Lockhart covers subtly mock the wizard’s hubris, using excessive amounts of gold, silver and rich colours. The Rita Skeeter biographies, widely known for being more fiction than fact, hold her name in as high esteem as the wizards she is featuring. The biopic of Albus Dumbledore is a tangle of vines, and at the top shows a pair of snakes whispering into the ears of a lion, a reference to the headmaster’s secret past. My favourite of the set is still Flesh Eating Trees of the World. This is an example where I only had the title to go on. The book has no credited author and the only mention of flesh-eating trees in the books is the reference to this textbook. The design became an exercise in negative space. How could I make the cover look like fairly normal trees at first glance, with a more sinister message lurking underneath? I’m pretty chuffed with how it turned out. Click here for the full 31 covers. And here's a video I made looking through my sketchbook at the original inked covers.